Tomatoes are commonly grown in home vegetable gardens. In order to produce a healthy crop of tomatoes, the plants will require the proper growing conditions and nutrients. Those with heavy, clay soils may wish to amend their soil before planting or opt to grow their tomatoes in raised beds. If grown properly, a tomato plant should yield 8 to 10 lbs. of tomatoes. Tomatoes are considered a warm-season plant. When transplanting young tomato plants, ensure that there is no further risk of nighttime frost, as the tender plants are susceptible to damage from extreme cold. Once the night temperatures are consistently above 55 degrees Fahrenheit it is safe to plant. Tomatoes need sunlight to produce and ripen their fruit, so plant them in an area that receives sunlight for at least half, if not most, of the day. As with many plants, tomatoes prefer an acidic soil, with pH levels of 6.2 to 6.8. A loamy, well-draining soil will help protect against root rot. 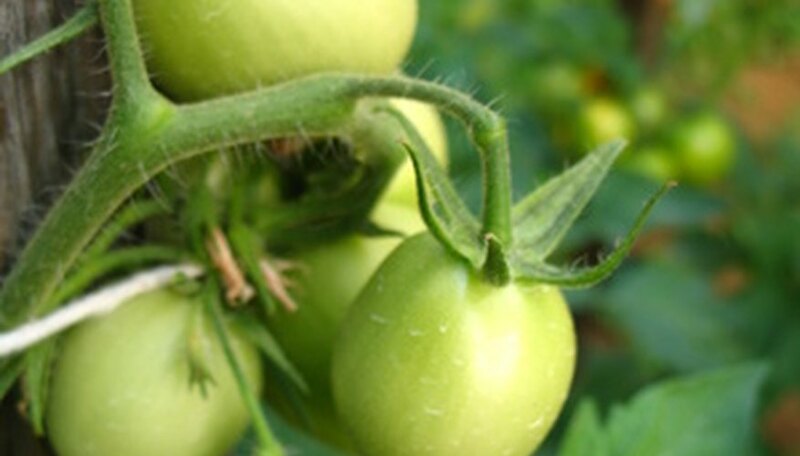 Fertilizer is an important requirement to growing healthy and robust tomato plants. Two weeks before transplanting the young plants into the garden, work fertilizer into the soil to a depth of 4 inches. Once the plants have produced golf-ball sized fruit, side-dress the plants by adding 1 tbsp. fertilizer to the soil around each plant. Repeat the side-dressing process again three and six weeks later. When fertilizing your tomato plants, do not let the fertilizer come into direct contact with the leaves of the plants, as this will chemically burn them. Water the tomato plants deeply on a regular basis, especially during prolonged periods of drought in the summer. If you are growing tomato plants in containers it is recommended to water the plants daily, as the soil will dry out more quickly. While you should never let the soil dry out completely, which can cause blossom-end rot, you will not want your tomato plants to sit in soggy soil either. Over-watering can cause the tomatoes to split. A good way to maintain a consistently moist soil is to use a plastic or organic-based mulch around your tomato plants. Mulch helps soil retain its moisture, while also shedding excess water. Why Do My Tomato Plants Flower But Not Produce Fruit?